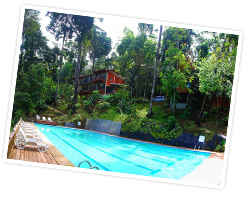 Mary Selva Ecolodge -Costa Rica- features a main house and ten bungalows set in a beautiful jungle canopy, and situated just about a mile from the beach. 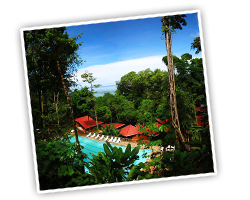 The Bungalows receive the ocean breezes from Costa Rica’s Pacific Ocean yet retain the sounds and views of the jungle. Mary Selva Ecolodge is a smoke-free hotel allowing our guests to relax and enjoy nature at its best, promoting a sustainable ecotourism. Each bungalow can accommodate up to 4 people. There are six individual bungalows ( most with queen size bed and Futon)– one of which has a King-size bed and Futon -- plus four bungalows (two pairs) that share a common door, enabling them to become one larger unit; great for families or groups! Also with One queen bed and Futon. 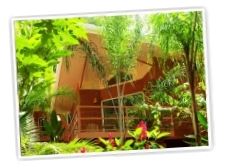 Each bungalow has a private bathroom, hot water, and a deck with lush views of the jungle. The main house has a reception area with a small gift shop, a large open air dining area (currently serving breakfast daily only), meeting/ conference room with a large TV, balcony with beautiful views, and space to just relax. Wireless internet is available throughout. We feature a 25 meter swimming pool. We feature a 25 meter swimming pool. Ours is not just a pool to get wet in and refresh yourself, but one in which you can actually swim laps. We look forward to welcoming you and making your experience at the Mar Y Selva Eco-Resort a memorable one, as well as your vacation in Costa Rica. We will do everything possible to make you comfortable and meet your needs. 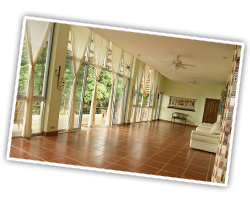 You will enjoy your stay at Mar y Selva near the Ballena, Dominical and Uvita beaches.